Summary: From the international bestselling author of Rebel Queen and Nefertiti comes a captivating novel about the infamous Mata Hari, exotic dancer, adored courtesan, and, possibly, relentless spy. 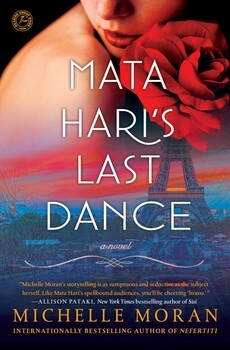 I was so excited to receive an advance copy of MATA HARI'S LAST DANCE by Michelle Moran! I adore Ms. Moran's books and my book club was even fortunate enough to have her call in many years ago. I think she is a terrific writer of historical fiction -- one of the best because she is able to blend fact with fiction to make compelling stories. MATA HARI'S LAST DANCE tells the story of Mata Hari, the infamous dancer who was put to death for treason against the French government. The novel follows Margaretha Zelle MacLeod from her early life to her death in Paris in 1917. Her father abandoned her when she was young, and she eventually married a military officer in hopes of a new life. Unfortunately, that didn't work so well for her. She ended up escaping from a very bad marriage (although she did leave behind her daughter) and redefined herself as the world famous performer Mata Hari. The novel follows Mata Hari's life as she travels the world. She found much success along the way as a dancer and performer; however, she never quite found true happiness. She went through many men and she was constantly trying to reinvent herself from city to city -- both professionally and, in a strange way, personally. Her life came to a tragic end when she was found guilty of treason that led to the deaths of thousands of French soldiers. MATA HARI'S LAST DANCE is another very good novel by Ms. Moran and I enjoyed it a great deal. I really didn't know all that much about Mata Hari prior to picking up this book, and even though I finished it a few days ago, I still feel like I don't really know the truth behind this very complex woman. It wasn't that Ms. Moran didn't bring her to life with her story. Rather, I just think we will never know what actually happened -- whether she was a spy or just in the wrong place at the wrong time. What I appreciated the most about MATA HARI'S LAST DANCE was how well Ms. Moran imagined Mata Hari. She obviously did her research but there are still many gaps in her life. I was very impressed with how well the author merged fact with fiction and created an intriguing tale. Not only was the story interesting, but the character of Mata Hari was incredibly complex. I don't doubt that she was an interesting woman, but Ms. Moran really did a remarkable job of bringing her life. Ms. Moran created a very interesting back story for Mata Hari from her childhood where she felt abandoned to her abusive marriage to an alcoholic. In addition, the guilt and sadness from leaving her child behind all contributed to making her a troubled adult. While Mata Hari was able to escape from her husband and reinvent herself, she obviously was an unhappy woman always looking for something to complete her. Despite finding her a bit "out there" (especially for her time), I felt so much sympathy towards her. And of course, it wouldn't be a Michelle Moran book if there weren't a lot of historical details. I loved how the author brought this time period alive. Her descriptions of Mata Hari's clothes and costumes were exquisite and I could picture them in vivid detail. In addition, she did a wonderful job of establishing a sense of what Europe felt like on the verge of war. Needless to say, I think MATA HARI'S LAST DANCE would make an outstanding book club selection. There is a reading guide with thirteen discussion questions along with some ideas for ways to enhance your book club meeting. Some of the themes you might want to explore include grief, loss, abandonment, second chances, honestly, insecurity, and death. It also might be interesting to discuss the different relationships in Mata Hari's life as well as her legacy. Overall, I thought MATA HARI'S LAST DANCE was a very interesting and entertaining book about a complicated woman. Highly recommended to fans of historical fiction! I know very little about Mata Hari - I always thought she was a spy. This sounds interesting. I bet my book club would love it.